Glamour has never been more grotesque than in Female Trouble, which injects the Hollywood melodrama with anarchic decadence. Divine, director John Waters' larger-than-life muse, engulfs the screen with charisma as Dawn Davenport, the living embodiment of the film's lurid mantra, "Crime is beauty," who progresses from a teenage nightmare hell-bent on getting cha-cha heels for Christmas to a fame monster whose egomaniacal impulses land her in the electric chair. Shot in Waters' native Baltimore on 16 mm, with a cast drawn from his beloved troupe of regulars, the Dreamlanders (including Mink Stole, David Lochary, Mary Vivian Pearce, Edith Massey, and Cookie Mueller), this film - the director's favorite of his work with Divine - comes to life through the tinsel-toned vision of production designer Vincent Peranio and costume designer/makeup artist Van Smith. An endlessly quotable fan favorite, Female Trouble offers up perverse pleasures that never fail to satisfy. A classic of the period before our beloved John Waters became more "respectable," this delightfully shocking comedy follows the trials and tribulations of Dawn Davenport from "cha-cha heels" obsessed teen to reviled murderess. The Criterion Collection has pulled out all the stops for this brand-new Director-Approved Special Edition - which includes a new digital restoration, Audio Commentary from John Waters, new and archival interviews, deleted scenes, rare footage and much more. Rare on-set footage and More! Tasty Tastelessness-----"There's nothing divine about this earthly piece of trash." Wow!! !-"Female Trouble: was made in 1974, 44 years ago and while I was living in Israel. I had never seen it although I did meet Divine when she went on tour and came to Tel Aviv. 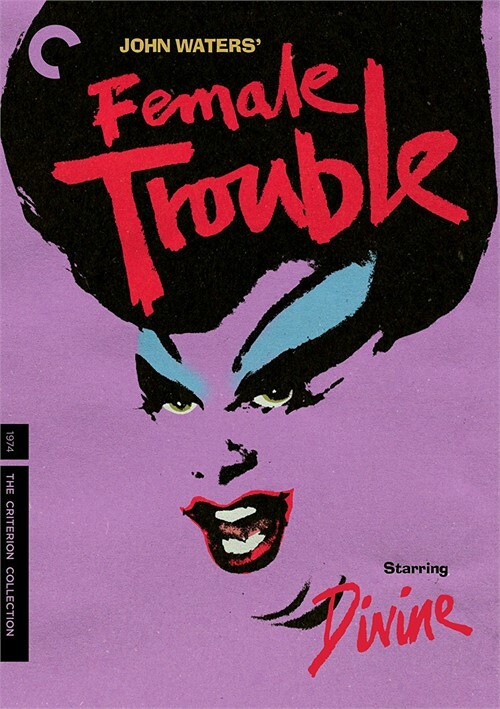 Now I finally got a chance to see "Female Trouble" on the gloriously restored Blu ray from the Criterion Collection. Glamour has never been more grotesque than in this film that "injects the Hollywood melodrama with anarchic decadence." 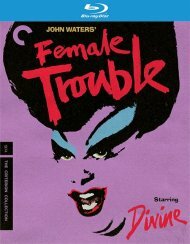 Divine, engulfs the screen with charisma as Dawn Davenport, the living embodiment of the film's lurid mantra, "Crime is beauty," who moves from a teenage nightmare hell-bent on getting cha-cha heels for Christmas to a fame monster whose egomaniacal impulses land her in the electric chair. The film was shot in director John Waters' native Baltimore on 16 mm, with a cast drawn from his beloved troupe of regulars, the Dreamlanders (including Mink Stole, David Lochary, Mary Vivian Pearce, Edith Massey, and Cookie Mueller) and it provides perverse pleasures that never fail to satisfy. The Criterion Collection has pulled out all the stops for this brand-new Director-Approved Special Edition - which includes a new digital restoration, Audio Commentary from John Waters, new and archival interviews, deleted scenes, rare footage and much more. As we watch, it is only natural to wonder where do these people come from and where do they go when the sun goes down? PLUS: An essay by film critic Ed Halterhate you and I hate Christmas!" screeches Dawn Davenport at her hapless parents after she fails to find her beloved cha-cha heels under the brightly decorated tree on Christmas morning. And so off she goes to begin a life of crime and debauchery.